South and North Korea agreed Monday to hold a third summit between South Korean President Moon Jae-in and North Korean leader Kim Jong-un in Pyongyang in September. The two Koreas held the fourth round of high-level talks in Tongilgak, a North Korean-controlled building in the border village of Panmunjom, and adopted a joint press statement on the details of the third inter-Korean summit to be held in Pyongyang next month. "We reviewed the implementation situations of the Panmunjom Declaration and seriously discussed issues related to its more active enforcement. We agreed at the meeting to hold a South-North summit in Pyongyang in September as planned," the two sides said after the high-level talks, referring to the agreement reached in the historic April summit. President Moon Jae-in will be the third South Korean president to visit Pyongyang following former presidents Kim Dae-jung and Roh Moo-hyun in 2000 and 2007, respectively. The summit meeting will be the third of its kind between Moon Jae-in and North Korean leader Kim Jong-un following their face-to-face meetings in April and May. 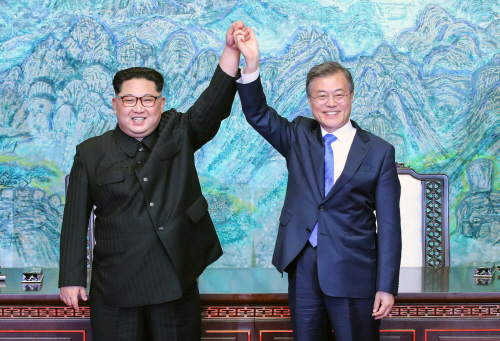 However, the two sides did not agree on an exact date and the details of the third inter-Korean summit are expected to be finalized through working-level talks. "We have agreed that the summit should take place sooner rather than later, but considering the North's situation, we agreed the summit to be held in September in Pyongyang. We decided to discuss an exact date considering many circumstances," said Cho Myoung-gyon, South Korea's Unification Minister who led the South Korean delegation. Despite Cho's explanation, there are speculations that the two Koreas already agreed upon the date for the third Moon-Kim summit. Ri Son Gwon, chairman of the Committee for the Peaceful Reunification of the Fatherland who led the North Korean delegation, told reporters after the talks that detailed schedule for the summit was already agreed upon. For now, many expect that the third inter-Korean summit will take place in mid-September, shortly after North Korea celebrates the anniversary of its founding on Sept. 9. South Korea's presidential Blue House said the summit could be held in mid or late September. "I believe holding the summit in early September might be a little bit difficult when considering realistic conditions," Cheong Wa Dae spokesperson Kim Eui-kyeom told reporters.